68030 or 68EC030 CPU and 128 MB RAM for Amiga 1200 and ACA-500 equipped Amiga 500. 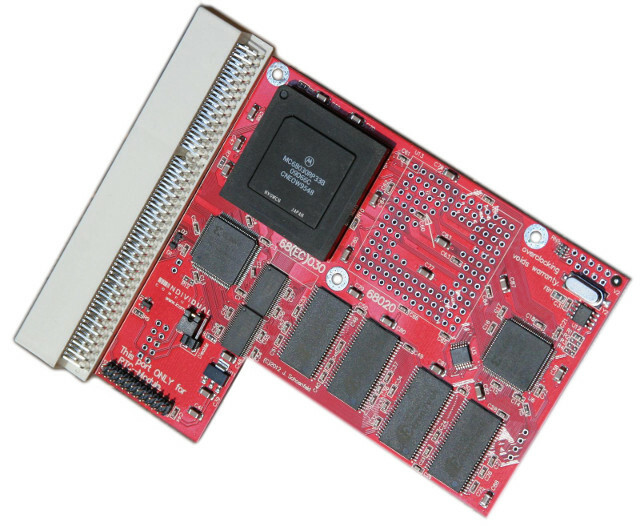 The ACA-1232 card comes with a full 68030 processor (clocked at 20 MHz, 25 MHz or 33 MHz) or a 68EC030 processor without MMU, and with 128 MB RAM on board. There is no realtime clock mounted on the card itself, but it can be expanded with an inexpensive clock port module on the card's clock port (the computer's clock port can still be used for other expansions). The 68020 processors on new cards are used 68020 processors. Use ACATune tool to configure the ACA1232.